If you’ve ever tried to mess with files in the Windows or Program Files folders of Windows 7, you’ve probably noticed that Windows likes to throw up permissions errors. This is mostly because these areas are considered protected operating system directories, and editing them can cause problems. But, if you know what you are doing -these permission blocks are just a huge annoyance. One of the ways around this problem is to set up a “Run as administrator” option to the context menu for troublesome file types. Windows doesn’t have an easy intuitive way to do this, but I’ll guide you below on the process and make it as simple as possible. Click the Windows Start Menu Orb and then Type regedit into the search box. Now Press Enter or just Click the program link. Once here, take a look at the (Default) entry’s data value. 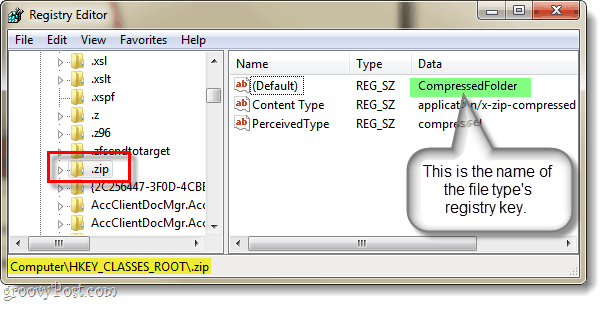 For .zip mine reads CompressedFolder. This means that the actual key I need to edit will be named CompressedFolder, so let’s go find it. There are two ways to find a key in the registry. One is obvious, just browse through your registry until you find it… The other way is a bit faster, just hit CTRL+F on your keyboard and type in the name of the key you are looking for. Since we know that the key I’m looking for is called compressedfolder, I can search for exactly that. This will let us find the key in a matter of seconds. Now, to make a copy we need to use the Export function. 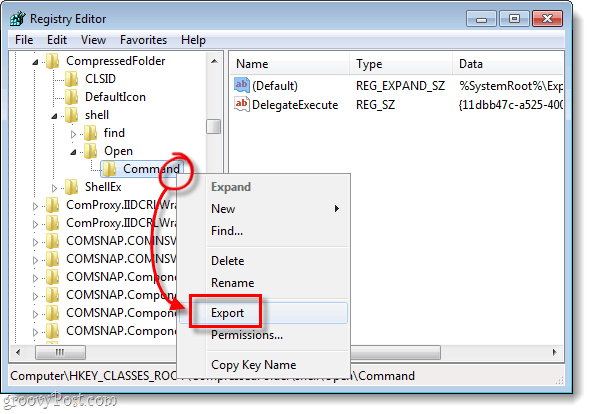 Right-Click the Command key and Select Export from the context menu. 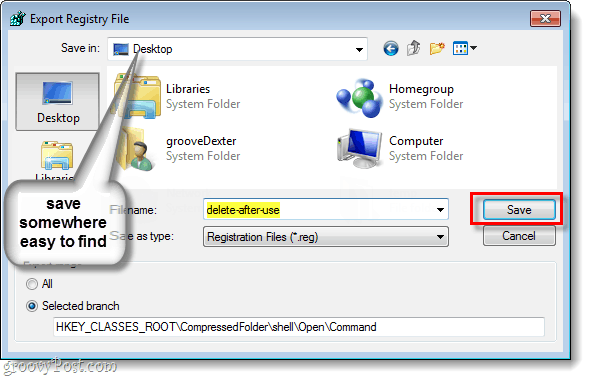 Windows will ask you to specify a file name and a location to save the copy. The name of the file is irrelevant, as the only thing that matters is the data within the file itself. Save it somewhere easy to find –we’ll be deleting it after we are done with it. Now that you have the file saved, Right-Click the registry file and Select Open with > Notepad. 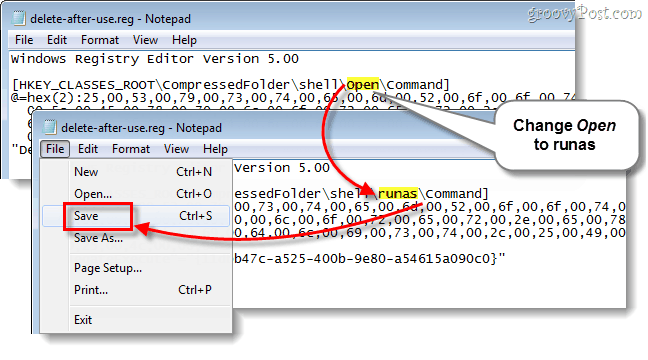 Now in notepad, we just need to change one word in the text of the file. We are going to change replace Open and in it’s place Type runas. Once that is done, Save the file. Now we just need to add our edited registry information to the Windows registry. 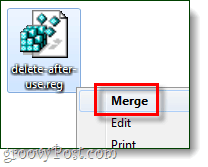 To do this, Double-Click the .reg file we just edited, or Right-Click the file and Select Merge. A small confirmation box will appear, Click Yes and then OK.
What this does is in effect create a new key called runas that is exactly the same as the original Open key. 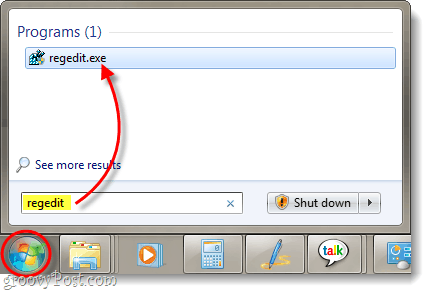 Now Run as administrator should show up in the context menu of the extension you just added it to. In this tutorial we covered the process with .zip file types, but you can repeat this process for any file type you like. 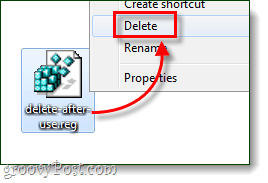 Don’t forget now that we are done with the edited registry file that we saved earlier, you can delete it! Cleanliness is next to grooviness! Thanks. This really help me! What do I do If It gives me ‘Cannot import D:DocumentsDesktopdelete-after-use.reg: Not all data was successfully written to the registry. Some keys are open by the system or other processes.’ ?